So I have been curious about using colored slips under my glazes for quite some time now. Earlier this year I got Techniques Using Slips by John Mathieson and have done some testing based off of the high fire salt section. 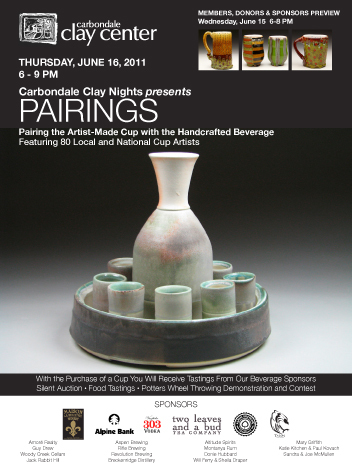 While I dont do any salt firing some of the results were interesting in the soda kiln. I am going to skip the plethora of various slips and colorant tests and go straight to the two that I settled on which were a green glaze (with a chrome/cobalt combo for color) and a blue slip (with a straight cobalt carb colorant). I am impressed with what the green slip is doing under my Pink Seto (which is 50% wood ash with a rutile and copper addition). When I get up to Carbondale I am looking forward to maybe playing more with leaving the slip exposed to get even more variation of color. Let me know what you think! ……Oh! And dont forget to swing by my studio this weekend to purchase some work before I take off! 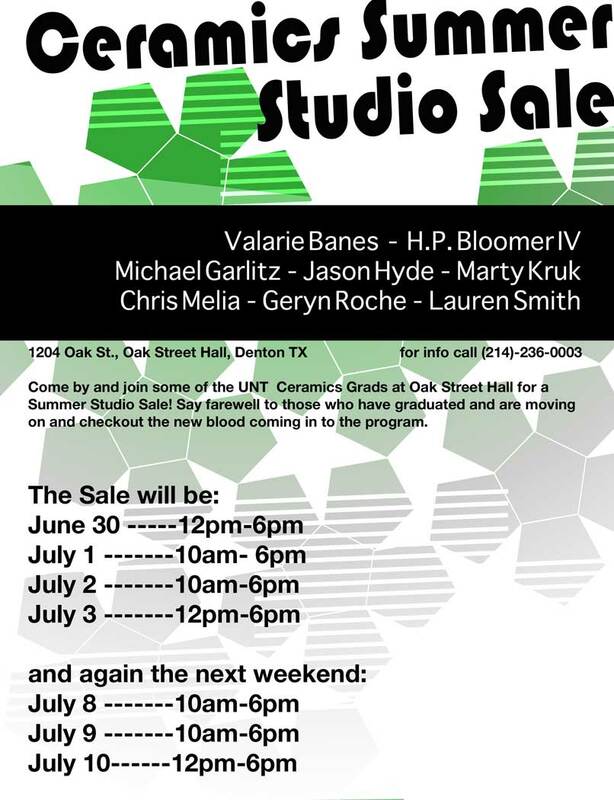 Come by and join some of the UNT Masters Ceramics Grads at Oak Street Hall for a Summer Studio Sale! Say farewell to those who have graduated and are moving on and checkout the new blood coming in to the program. First off I would like to invite you all out to Rockwall this Saturday where Lauren Smith and I will be selling at the San Jacinto Arts Market. I am also in several other shows this summer. If you get the chance go check any of these out. There are many great artist in all of these exhibitions. Featured tastings by Maison La Belle Vie, Guy Drew, Woody Creek Cellars, Jack Rabbit Hill, Talon Winery, Aspen Brew Co, Rifle Brewing, Revolution Brewing,Breckenridge Distillery, Altitude Spirits, 303 Vodka, Peak Spirits, Montanya Rum and Two Leaves and a Bud.